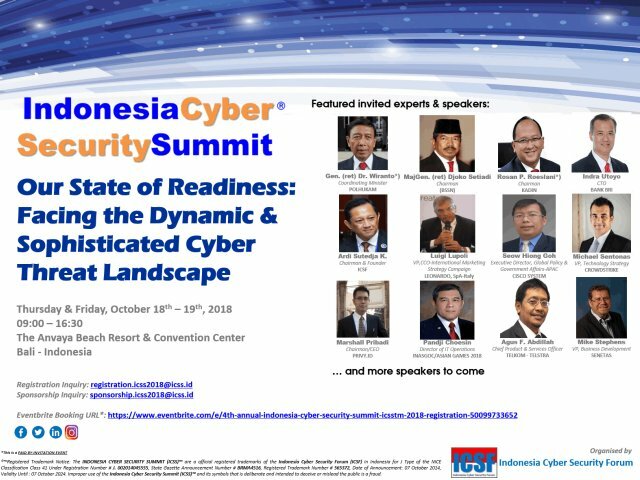 Now in its 4th year, the Annual Indonesia Cyber Security Summit (ICSS) is coming, and it is becoming an all-day conference focused on investing and developing the infant cyber security industry in Indonesia and the region. Current defense spending is modest, totaling $8 billion, but is expected to increase. Increase in defense spending partnered with the estimated $10 billion in losses from cyber crime annually, will translate into increased cyber security spending in future years. Current military spending increased 163% in past six years, but totals $6.9 billion annually. Spending expected to increase in upcoming years. IT infrastructure spending is higher, expected to reach $22.0 billion by 2018 Indonesia has recognized the importance of cyber security, but has only implemented patchwork solutions. IT build out, infrastructure enhancement, security management and human resource training offer the greatest areas of opportunity. This year’s ICSS will explore the financial opportunities, trends, challenges, and investment strategies available in the high growth cyber security sector. Speakers include leading cyber professionals, technology analysts, venture capitalists, fund managers, investment advisors, government experts, and more. Attendees will have the opportunity to network with key influences in the investment and cyber security industries. A welcome cocktail reception will be held following the presentations on the evening of the 18th of October 2018. So if you are considering and plan to attend this year’s Annual ICSS, we are now accepting Delegates Registration, so that you will be able to secure your seat and hotel rooms. And Delegates Registration are rather high during the last few days, so that we are encouraging you to act quickly to secure your attendace to the 4th Annual Indonesia Cyber Security Summit (ICSS) 2018.